The frequency of dry cleaning may vary depending on the level and type of traffic and the conditions to which your carpet is exposed. This may range from as little as 6 months to 24 months between cleanings. 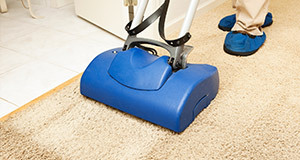 Carpet manufacturers recommend that your carpet should be professionally cleaned at least once every 24 months to maintain its appearance and useful life. Our experience had been that the typical cleaning frequency for a home owner with 2 children and a pet is annually. Contact CLEANER by Pfarr today for a free quote. With our dry cleaning methods you’ll be on your carpets in a couple of hours and your carpet will stay clean longer.